This is the General tab of PDF2XL CLI's options dialog. Click on any option for an explanation on what it does. This combo box allows the user to select the user interface language for PDF2XL Enterprise. Note that changing the user interface language will only go into effect once you restart the application (PDF2XL CLI will automatically suggest a restart if the user interface language is changed). If the new language was not originally installed with the application, the user will be prompted to download the language components (or install them from the CD) using the Install Language dialog. This setting controls the zoom in which the document is initially opened. The options include Original Size, which will keep the size of the document; Fit to Width, which will automatically set the document to fit PDF2XL CLI's window, and Set to, which will allow the user to set the default size (in percents). Note that if the Remember zoom for each document option is set, this setting will only be used when a new document is opened which hasn't been opened before. If this option is checked, the Start pane will automatically be displayed when PDF2XL CLI is loaded. If this option is checked, the Start pane will display the tutorial options. Notify: PDF2XL CLI will notify the user that a new version is available for download. Download and notify: PDF2XL CLI will automatically download any available uploads which are available for the current license, and notify the user that the update is ready to be installed. Download and install: PDF2XL CLI will automatically download any available uploads which are available for the current license, and prompt the user to install it when PDF2XL CLI starts. If this option is checked, PDF2XL CLI will use the divider finding algorithm to find and ignore horizontal dividers. The algorithm uses only characters from the list when calculating the horizontal dividers. If this option is checked, PDF2XL CLI will use the divider finding algorithm to find and ignore vertical dividers. The algorithm uses only characters from the list when calculating the vertical dividers. If this option is checked, PDF2XL CLI will ignore blocks of consecutive spaces (i.e. will not use them to recognize tables or convert them). The user can set the exact limit of consecutive spaces that should be ignored. In some cases, PDF might contain text on top of other text. If this option is checked, some of that text may be ignored. Uncheck this option if you want PDF2XL CLI not to ignore any of the text. 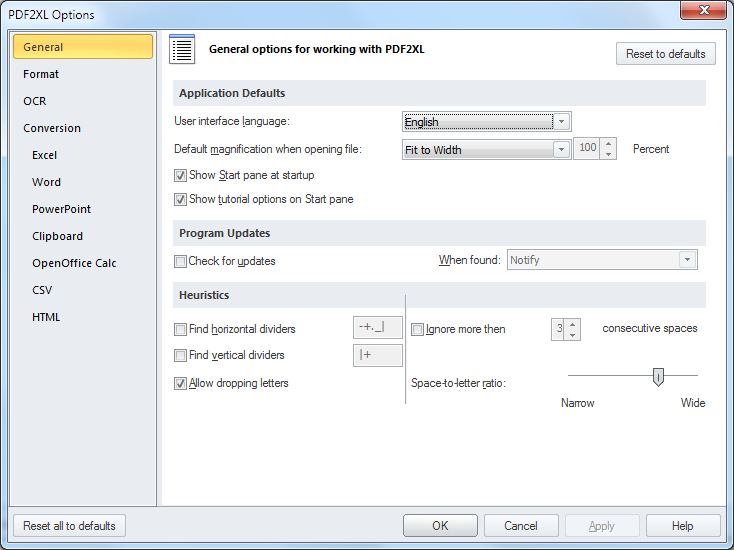 This setting can be used to change the minimal distance between words which PDF2XL CLI will consider a space; setting it to narrower will ensure getting a space in the output even when the words are close together, while setting it to wider might combine parts of words even if they do not touch.